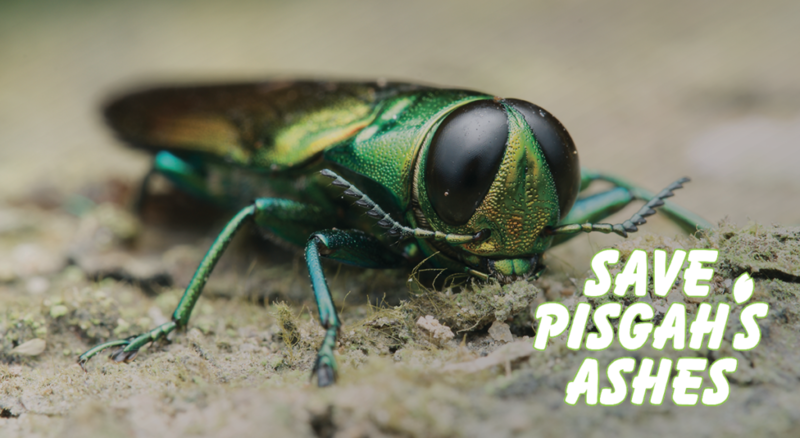 The emerald ash borer – the voracious metallic-green beetle you see in the photo above – is quickly eating its way across North America, killing our ash forests along the way. The pest came across the ocean from Asia, transported in wooden packing materials. While many species in our forests were foreign to the borer, our ash trees provided a taste of home. The adults quickly began to feed on the leaves of these trees and lay their eggs between layers of bark to protect them. Back in Asia, parasitic wasps would occasionally prey on their larvae, but there are no wasps that hunt them here in North America. Given the abundant food source and lack of predators, the insect thrived. 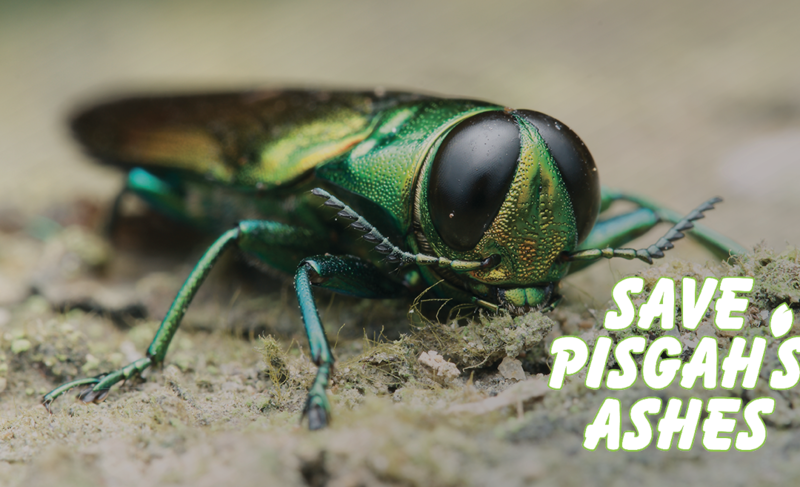 The emerald ash borer is now eating its way through Pisgah National Forest, so MountainTrue and The Pisgah Conservancy have teamed up on a project to treat and save 100 ash trees this spring … before it’s too late. Find out more and how you can lend a hand. These beetles are a half-inch long and have a metallic green color. They were first discovered in the United States in 2002, and since then, they have killed hundreds of thousands of ash trees and threaten millions more. The damage they can cause in just a few years has alarmed scientists and land managers. Help us reach our goal of saving 100 ash trees in Pisgah National Forest before it’s too late. 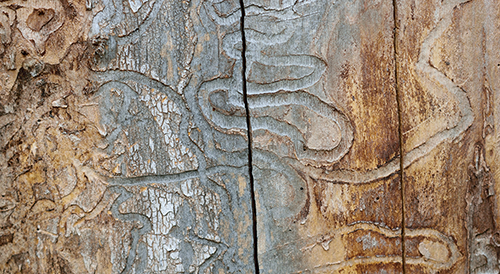 When the larvae hatch under the bark of an ash tree, they feed on important vascular tissue, creating swirling tunnels called galleries. Eventually, the tree becomes unable to transport nutrients and water from roots to branches, and it dies. Once the trees in one area have been killed, the insect moves on to new territory. Ash borers can only fly a few miles each year, but they often hitch rides on firewood or other products. This has allowed them to spread more quickly despite the various quarantines and restrictions that are in place around moving wood products across state and county borders. 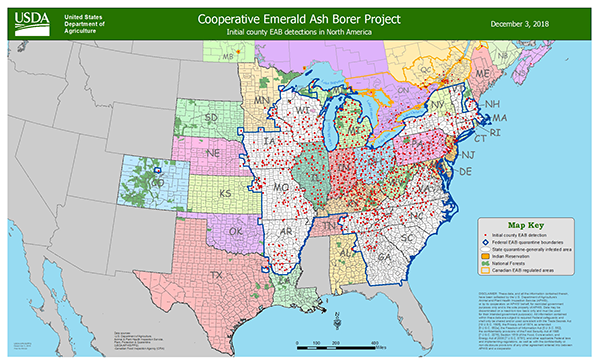 The Emerald Ash Borer was first found on the Tennessee side of Great Smoky Mountain National Park in 2013, and is now found throughout North Carolina – its spread having been assisted by people moving firewood. When the Ash Borer has attacked a tree, you may find D-shaped holes in the bark made when the matured larvae exit the tree. Unfortunately, by the time these holes are visible, the tree is usually too damaged to be saved. Instead, we look for signs of early damage, such as dying branches, trees that are losing leaves early in the year and other signs of poor health that are indicators of an infestation. By treating them early, we can protect them throughout the infestation period, approximately 5-7 years. Once the beetle has exhausted its supply of untreated food, it moves on. Our plan is to then use the seeds of the trees that we have treated to reestablish our native ash tree stands for the enjoyment of future generations. Learn more and help MountainTrue and The Pisgah Conservancy defend our ash trees against the emerald ash borer.